Loads of controls to create a wide range of sounds. No stereo output. Battery compartment lid could get lost. 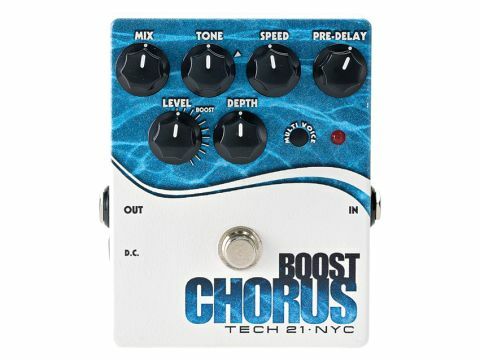 Where many chorus pedals find themselves with just a pair of speed and depth knobs, the Boost Chorus pushes the boat out and adds another four. "This is a very capable pedal that delivers myriad flavours of chorusing." A mix control adds in the amount of effect you need up to a 100 per cent wet signal, the tone knob operates an analogue circuit that offers treble boost or treble cut, while the level/boost knob adjusts the output to a predetermined level when the pedal is engaged, or can be used to set the amount of signal in a parallel effects loop. The secret weapon is the pre-delay knob, which sets the delay time of the chorus from 0-50ms - a range that will also conjure up mild flanging and some doubled sounds. On top of this, there's a multi voice switch that creates additional choral voicings for a thicker sound. With so much tweakability, this is a very capable pedal that delivers myriad flavours of chorusing and, yes, it can do that '70s sound, giving a good account of itself next to our own vintage CE-1, CE-2 and Clone Theory.